The two Davids (Jackson and Oziel) met at an Archie Edwards Blues Heritage Foundation jam in Riverdale, Maryland. They formed and instant bond based on their love of blues and old rhythm and blues music. They have performed together with Sheryl Sears and in other groups before forming the present duo. Jackson formed the first D.C. Blues Society Band in 1984, and has performed in numerous bands in the Washington D.C. area. 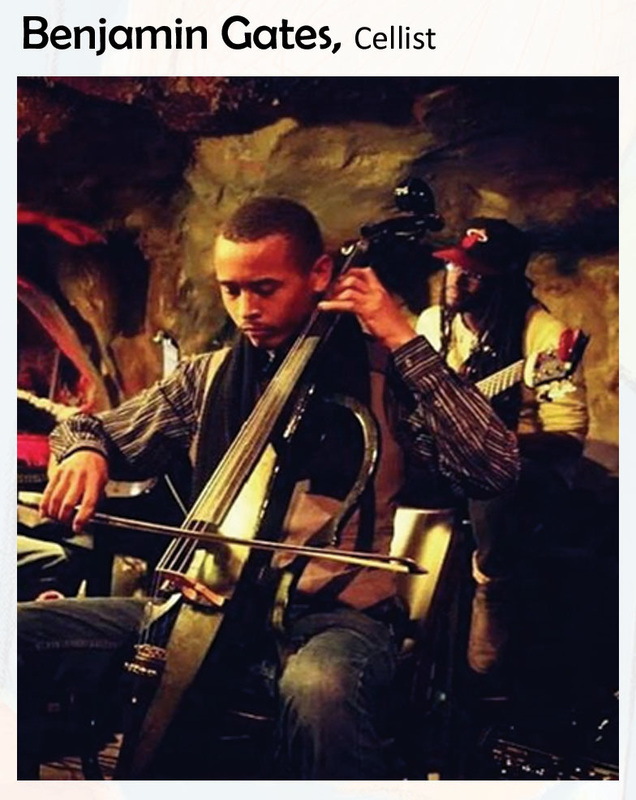 Oziel began exploring the blues in his teen years. He hosted a blues and R&B radio show in Boston, Massachusetts , while in college. Always a singer, he picked up the guitar in later years and began playing the blues. 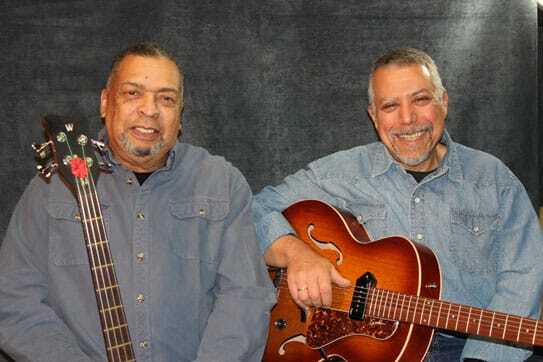 ​In January 2015, Jackson and Oziel represented the D.C. Blues Society in the solo/duo competition at the International Blues Challenge in Memphis, Tennessee. They performed at the 2015 D.C. Blues Festival held at the Carter Baron Amphitheater. They formed the band, DC Mudd in 2015 and represented the D.C. Blues Society in the band competition at the 2016 International Blues Challenge in Memphis, Tennessee. 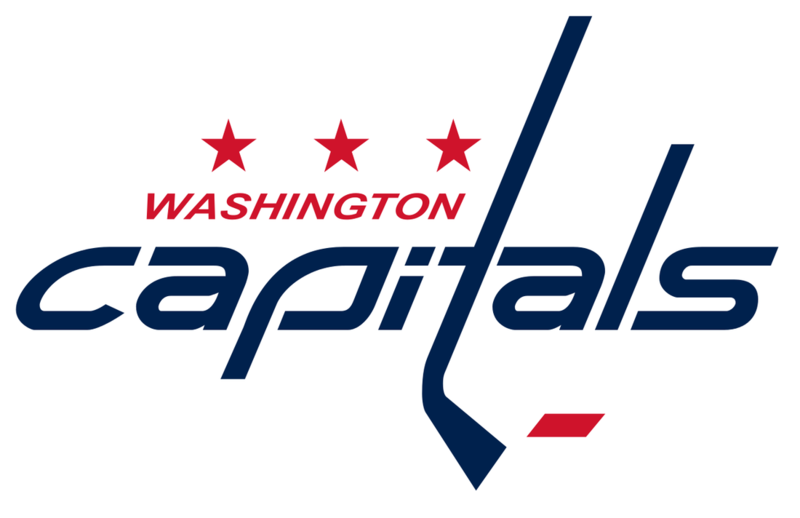 The band played the D.C. Folk Festival at Glen Echo Park and the D. C. Blues Festival at Carter Baron Amphitheater. Topic: Where Are You As An Artist And What Do You Need To Do To Move Ahead? 10:00 AM - 10:15 AM - Mix and mingle with fellow artists. Light refreshments. Financial Management Seminar: "Grow Healthy, Grow Wealthy"
Children's National Health System is the premier provider of pediatric care in the Washington, DC, metropolitan area. Each day, our experts give kids the best possible care and the chance to be their happiest, healthiest selves. Because we don’t just want kids to grow up. We want them to grow up stronger. Creative & Therapeutic Arts Services has provided programming to patients, families and staff since 1978. A small but dedicated team of trained professionals works to foster an atmosphere of empowerment and support to our inpatients, outpatients and their families. We offer colorful creative choices, soothing sounds, imaginative opportunities and inviting galleries and exhibits. Our mission is to combine the healing power of art, art therapy, therapeutic music, harp therapy, animal visitations and performing arts to help our patients heal, to assist patients with their pain and symptom relief, empower self-awareness and emotional expression for coping skills, ease anxiety, provide a creative outlet for depressed patients, and enhance family and social relationships. Children's National Creative and Therapeutic Arts Services/Patient Experience has invited Art Impact USA to organize an amazing exhibition with very special programming events from October 1st through January 14th. Please do join us! "Light of Our Future" art exhibition and special event programs offer opportunities for the local District of Columbia metropolitan communities, Children's National Health System patients and their families to enjoy inspiring artwork and music, with a focus on healing, health, and joy. The objective is to calm and de-stress as well as entertain participants during the 3-month run of the exhibition. Music and visual arts in the realm of healing therapies is well known to be an effective component in the healing process. Up to 100 patients (ages newborn to 19 y/o) and their parents and families will be able to attend the musical performances, art exhibitions, S.T.E.A.M. educational presentation and art therapy educational programs for free. The public attendees of these programs are expected to include high school art students; prospective art collectors and the local community of interested art enthusiasts. The children will receive free coloring books and beautifully illustrated books. 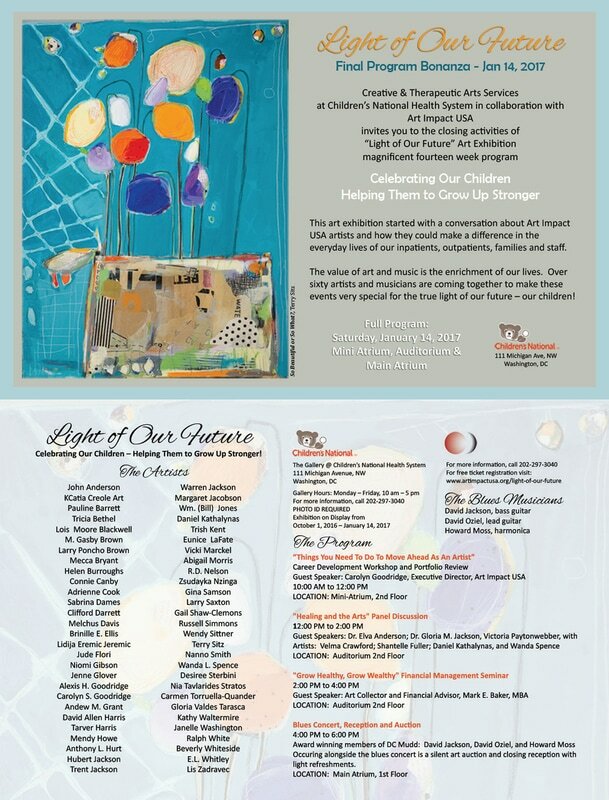 "Light of Our Future" art exhibition and special program events offer opportunities for the local District of Columbia metropolitan communities, Children's National Health System patients and their families to enjoy inspiring artwork and music, with a focus on healing, health, and joy. The objective is to calm and de-stress as well as educate participants during the 3-month run of the exhibition. Music and visual arts in the realm of healing therapies is well known to be an effective component of the healing process.